Still Alice is a 2007 novel by Lisa Genova. The book is about a woman who suffers early-onset Alzheimer's disease. Alice Howland, a 50-year-old woman, is a cognitive psychology professor at Harvard and a world-renowned linguistics expert. She is married to an equally successful husband, and they have three grown children. The disease takes hold swiftly, and it changes Alice’s relationship with her family and the world. The film adaptation of Still Alice, starred Julianne Moore in an Academy Award-winning role as Alice. There are over 2.6 million copies in print, and it has been translated into 37 languages. It was chosen as one of the thirty titles for World Book Night 2013. A safe house for the Elderly? The elderly are at greater risk for criminal acts. Fraility and the inability to put up a physical opposition to an attack is one of the reasons. Decreased attention to safety measures, and a tendency to trust indiscriminately may also be factor. Limited social interaction, which gives the attacker confidence that they will not be found out soon makes the elderly an attractive target. They are also at a risk from fraudsters who promise great investment deals or other financial scams. Society needs to create support for the elderly so that they do not fall prey to such evil machinations in their golden years. Our living arrangements need to be neighbourhoods in the real meaning of the word - places where those who live near to each other are concerned about the well being of others who live in their locality. Society needs to be inclusive of the elderly who may no longer be able to participate in the same activities that they pursued during their 40s and 50s. Often people tell me that such problems of the elderly are a western issue, since we have joint families in India. The truth is that even in India we have a large number of elderly who face a variety of issues on which they need help. Not every person has family members to help them maintain their quality of life in the latter years. Believing in the warm and fuzzy idea of loving and caring multi-generational Indian families, where all pains of the elderly are attended to, is like an ostrich hiding its head in the sand. Awareness must precede action. This article, "How safe are senior citizens in Ahmedabad" on crimes against the elderly in Ahmedabad is an eye opener for us all. 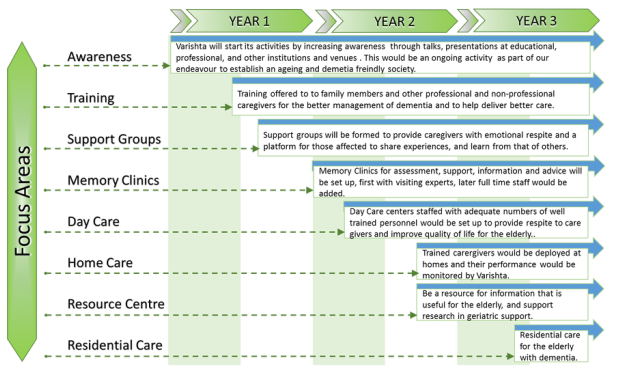 After over a year of waiting, worrying and wringing of hands, finally, the registration of a non-profit company to address the issues of dementia in the elderly has come through. The company has been registered by the name Silversmile Elder Care Foundation. The Foundation will take up its main objective of creating awareness and providing support for dementia in the elderly under the name "Varishta" which means senior, or elder person. In order to take the initiative further we need assistance of all kinds, from money, and advice to introductions and helping hands. Your assistance is invaluable. Please write to us at care@varishta.org for more information. If you wish to send a donation you can find details here. I was unable to get the company registered in any of the names that I would have liked, and at one desperate point I was willing to accept any name, just so that I could open shop (so to say) and start doing some good work. We went ahead with the name Silversmile Elder Care Foundation for the registration, which is a mouthful, so we finally decided to operate under 'Varishta' as an easy to remember, relevant name. I must share that for a year I was merrily led up the garden path by a chartered accountant who had no concern for my objectives or my time, had little knowledge of correct process and requirements of the Registrar of Companies, and scant regard for ethics. I finally ditched him and got my registration done through another professional. I only wish I had taken things into my own hands earlier. That is a thing of the past now, and I have my eyes set ahead on the next task, Wish me luck, and hope to see you join me on the way!